So, have you ever wondered what would happen if you chopped up a whole pie and mixed it in a batch of brownies? I have to say, I am not a Pecan Pie girl. AND I don’t normally do nuts in desserts. Nuts possibly fall below fruit on my dessert chart. So the thought of a whole pie dedicated to nuts isn’t going to get my blood sugar pumping. BUT it seems like a lot of people DO like Pecan Pie. I mean, it’s kind of in the pie world. So I just thought what would happen if you chopped up the pie and threw it into brownies. Some people like nuts in brownies. Some people like Pecan Pie. I am here today for those people. What I found, though, is that nuts in brownies aren’t all bad. Especially with crust and sugary, pecan pie filling bits. 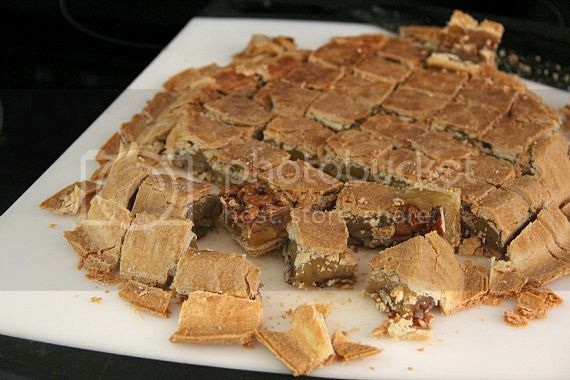 So yeah, I chopped up a whole Pecan Pie. Totally crazy, but totally delicious. 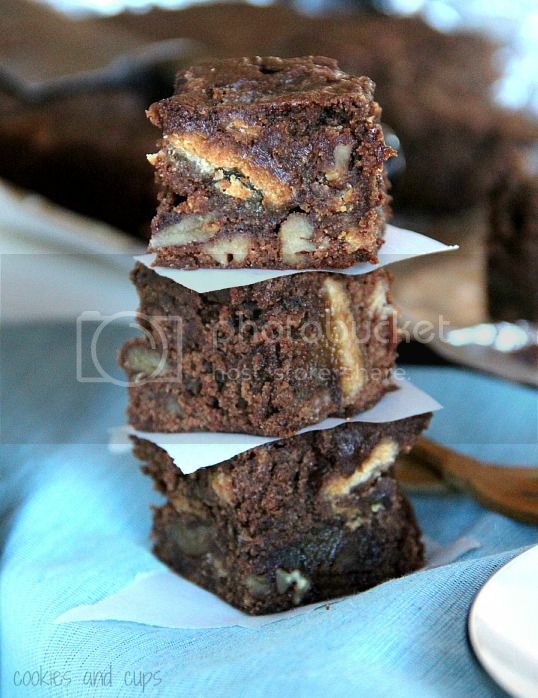 Pecan Pie Brownies. Do it. See, here’s the poor unassuming pie. See, pie chunks in my brownie batter. Kind of awesome, isn’t it? Then just bake. And wait. Can you even believe it worked? In a medium saucepan combine chocolate chips and butter and heat over medium-low until melted, stirring consistently. Set aside. In your stand mixer combine sugar, eggs, vanilla and milk, mixing until incorporated. 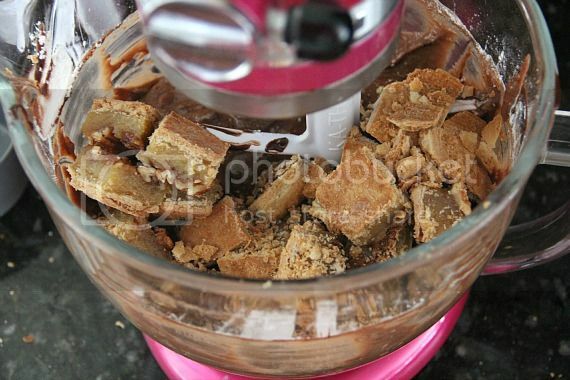 Slowly add in the chocolate mixture and HALF the pecan pie cubes, continuing to stir until well mixed. (Batter will be lumpy do to the pecan pie bits). Add in the flour, baking powder and salt, stirring until just incorporated. Add in the remaining pecan pie cubes, stirring until evenly mixed in. Spread the batter into the prepared pan and bake for 40-45 minutes, until center is JUST set and a toothpick inserted 2 inches from the edge comes out clean. Transfer pan to wire rack and allow to cool. A simple variation on a classic dump cake. Made with Apple Pie Filling, cake mix and butter! I topped mine with some oats and brown sugar too. The perfect dessert for a potluck or weeknight!! These look totally yummy! I can’t wait to make these. Hahahhaha, this is insanity of the best kind!! Incrediballs. That unassuming pie went to be reincarnated into something its little, feeble pie mind couldn’t have even imagined. Pecan pie it one of my very favorite desserts- these brownies look outrageously good! you are a wild woman! AWESOME! I just love the way your brain thinks:-) Pecan pie is a yummy yummy thing, but covered in chocolate brownies…even better!!! O.M.G., brownies and pecan pie rolled into one delicious looking dessert, I think I may cry at the wonder of it all! Thanks for sharing. I am not a pecan pie girl either nor am i into nuts in desserts…I like them NEXT to my desserts, not in them, but I love the filling of pecan pie and the flavor so much that I overlook, the well, nuts. Lol . I love that you just dumped it all into brownies. I am on board! This is the best idea ever. Count me in!! Genius! I think I’ll make these so I can enjoy them while watching tonight’s season premier of Vampire Diaries…I know you’re excited! I love pecan pie! I have been on a real pecan kick these days! It seems like every other recipe I make has pecans in it! This looks awesome – I think I’ll continue my trend with these! I’ll let you know how they turn out! My goodness. Who would’ve thought??? Very interesting! 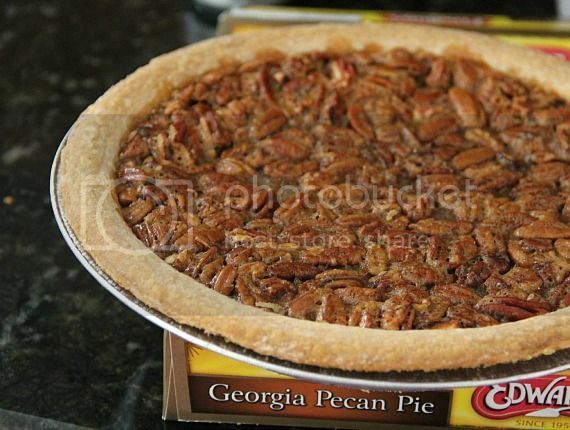 Although I don’t like pecan pie, this is a really cool idea! And your brownies look absolutely beautiful. Totally genius! I am not a fan of pecan pie or nuts in dessert either, but this is just so over the top cool! i think i would totally add some coconut too, yummy! oh my gawd…seriously drooling right now! For some reason the pieces of crust in there sound ah-mazing to me, why crust?! I don’t know..it just does. Chop up a pecan pie in smaller pieces and add that to a batch of chocolate chip cookie dough. I credit Anna at cookiemadness.net for that idea. So yummy! But the brownie idea looks FABULOUS too! Wow you really do chop up a pie and put it in there! Fun idea. Holy awesome Shelly. I love the way you think and keep them coming because this, missy, is amazeballs! Genius. I wonder what other awesome combinations are out there? I think you’ve just opened up a pandora’s box of brownie possibilities. your brain is a dangerous place, and sweet dangerous place! 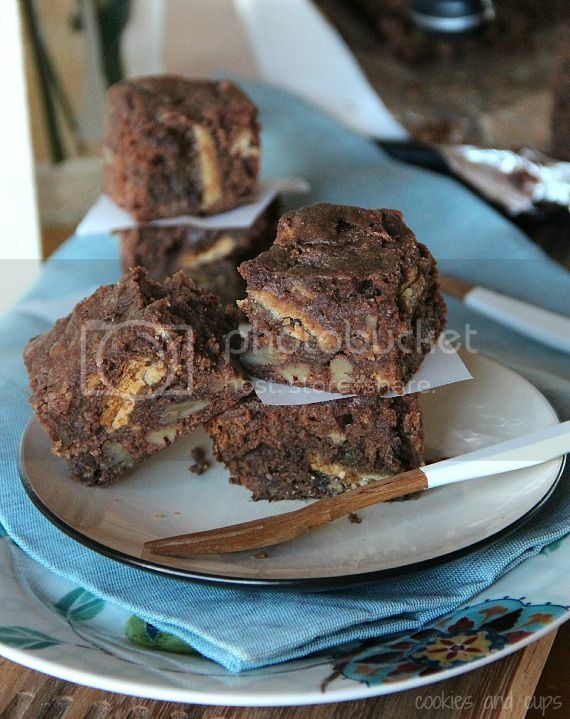 I’m a sucker for ooey gooey brownies… and these are calling my name! Yum, yum, yum – mouth is watering! This may have to be Thanksgiving Dessert with vanilla ice cream and chocolate sauce! Sometimes I think you just try to come up with ways to make fattening things way more fattening. And I’m totally ok with that. What a creative and fun recipe! Perfect for the Thanksgiving holiday! So, i like Pecan Pie, because it’s my favorite. And thanks for your delicious recipe. My husband would go nuts for this. He is both a nuts-in-brownies and a pecan pie fan. You did not just put a pie IN the brownies?! Genius!!! I’m with you on the nut thing, but for some reason pecan pie is delicious to me. I think it’s all the brown sugar goodness around said nuts. I’m going to have to try this amazing creation. Thanks! I’m not a big fan of nuts in desserts either, but I do love pecans. Seriously, you are a genius. I made these yesterday and brought them in to work today. Oh my goodness…fantastic. I don’t even want to know how many calories are in one piece…espcially with how large I’ve been cutting them! They are SO GOOD! I baked mine for 48 minutes and wondered if they needed longer, but pulled them out because I was afraid they would get too done around the edges. The middle is very gooey…I think I should have baked a bit longer. But I guess with all thie pie goo, the brownies would have to be gooey too. Very good recipe…definitely not the last time I’ll be making these!! This one is now tied with the butterfinger blondies with butterfinger buttercream as my favorite Cookies & Cups recipe! I can’t get enough of those bad boys. I’ve also been wanting to make the death by Snickers recipe too…I bet that will end up as a 3 way tie with these 2! Love your blog…thanks for all the delicious recipes and great stories & humor. OMGEEE – I may have to try this with a pumpkin pie too!! A girl can never have too many pie/browine desserts! I made this and they are good. Moist. However, it seemed to miss something. Like vanilla. I know that seems odd. If I make again I will add vanilla. I am saddened to know that you are not normally a “nut” girl…..I LOVE NUTS. Fortunately, that is forgivable since you do have some seriously delicious recipes posted to your site and I’ve attempted quite a few. I have not deserted you even though I work out regularly. My co-workers, fellow 911 dispatchers, are the beneficiaries of these tasty treats and they appreciate you too. 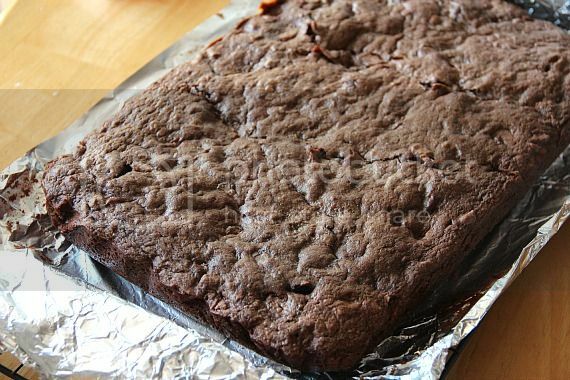 Can a boxed brownie mix be used to make it Semi-Homemade instead of “From Scratch”? Just wondering. Awe-some idea tho!!! Thanks! Shelly, can I ask why you mixed in half the pie before adding in the dry ingredients? I ask because I want to use a brownie mix but am concerned about dumping in the whole chopped pie into the batter since that’s not what you did. Thanks! 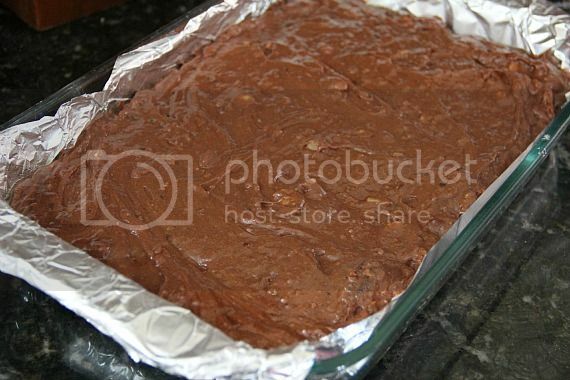 Hi, I mixed in half of the pie cubes into the prepared brownie mix…not into the dry ingredients. OMG! I’ve died and gone to heaven! Love nuts i.e. walnuts/pecans and put them in much of my baking as much as possible. Chocolate is a given because I’m always sneaking chocolate into most everything I make too…..ha can’t wait to make because this looks so yummy!! Thank you!